Many opera fans learn to live with partial successes, accepting the difficulty of achieving excellence in such a collaborative art form. But Friday evening at the Kravis Center in West Palm Beach was one of those rare occasions when everything came together, in Palm Beach Opera’s tremendous performance of Verdi’s masterpiece Otello. All the leading roles received first-class performances, with the singing becoming more powerful and meltingly beautiful as the opera drove to its tragic ending. The orchestra under artistic director Bruno Aprea distinguished itself in Verdi’s subtle, complex music. And the detailed, well-rehearsed stage direction and darkly traditional sets provided a strong foundation for a performance of what many consider to be Verdi’s greatest work. Making his first appearance in the role of Otello was the Virginia-born tenor Carl Tanner, a hulking presence whose manner become more ominous as the opera proceeded. His voice also grew in power and expressiveness through the evening, as the proud general of the opening scene became the twisted, tormented killer of the last. His strong, tightly focused voice rendered brilliant, powerful high notes, and he worked Otello’s anguish and red-hot anger into his singing, with an especially strong account of Dio! Mi potevi scaglia. Also making her role debut was Slovenian soprano Sabina Cvilak, whose rich, lyric voice arched and soared in Desdemona’s long vocal lines. In the last act, she gave a heart-rending portrayal of an innocent young women who senses her own doom, with a softly rendered Willow Song, cry of Ah Emilia, Emilia, addio, as she becomes aware of her fate, and a final, poignant, sensitively phrased Ave Maria. Others may take the role of Iago as an opportunity for cartoonish leers and ham-fisted gestures as he plants the seeds of jealousy that drive Otello to murder. But baritone Tom Fox was a subtly drawn villain, using a raised eyebrow or a hint of a smile to express contempt for the people he manipulates. When he puts a fatherly arm around a young Venetian officer and tells him what he’s going to do for him, he looks like the island of Cyprus’s most sinister car salesman. Vocally, Fox had the goods, too, with a particularly strong lower register. His Credo, in which Iago expresses his cynical philosophy of life, was a stark and powerful statement of evil. In Otello the orchestra plays a larger and more complex role than in other Verdi operas, and the musicians in the pit Friday evening gave a sensitive, symphonically rich performance that fully met the composer’s challenge. Although one exposed passage revealed intonation problems in the cellos, the performance was technically almost impeccable. Under Aprea’s baton, they seemed to breathe with the singers on stage, as they rendered Verdi’s strange, restless accompanying figurations, such as the passages that accompany Otello’s sorrowful reflections. And they brought off the moments of orchestral grandeur, such as the opening storm scene and the somber, brassy chords after Otello throws Desdemona to the ground in Act III. Under the stage direction of Bernard Uzan, the action was natural and fluid, with subtle details on stage that enhanced the work without being distracting, such as the way the children in Act II presented flowers to Desdemona. The chorus gave a particularly strong performance. 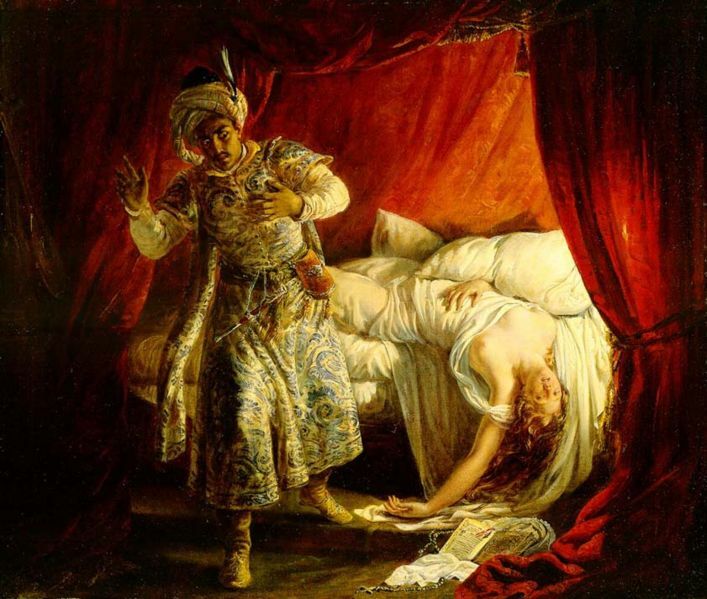 In addition to providing powerful vocalism, the members of the chorus acted the parts effectively, such as their expressions of horror as Otello hurls Desdemona to the ground or their fear for the safety his ship as it attempts to land in a storm. Palm Beach Opera repeats Otello Saturday at 7:30 p.m. and 2 p.m. Monday with Allan Glassman, Michele Capalbo and Daniel Sutin in the leading roles. Carl Tanner, Sabina Cvilak and Tom Fox repeat their roles Sunday at 2 p.m. Call 561-833-7888 or go to www.pbopera.org.